Gas from Liverpool Bay is delivered to site through a 27 km pipeline from the Point of Ayr Gas Terminal operated by BHP Billiton. 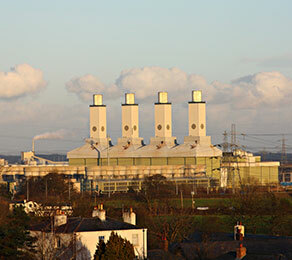 A backup gas supply is available through a 2.6 km pipeline connected to the National Transmission System (NTS) at Burton Point. The gas treatment plant processes gas which is surplus to power station requirements for export into the NTS. Over the years, ground water had caused a degree of erosion and undermined the concrete cooling pipes that feed cooling water to the power station. CCL was presented with the problem of filling the voids that had been created and consolidating the ground beneath without damaging the existing concrete pipes. The company designed and trialled (on site) an innovative system of application which allowed divers to carry out the grouting operation to fill the voids from within the pipes. As a specialist concrete repair company, CCL was selected by the client EON because of its previous partnership on a similar project when CCL was tasked with solving and delivering complex repair problems. As with the previous application, CCL demonstrated through on-site trials that it could provide and execute a practical and realistic solution.